Hennes & Mauritz AB or H&M, the Swedish fashion giant, is in big trouble. According to its quarterly report released on 27 March 2018, the world’s second-largest clothing retailer is now sitting on $4.3 billion of unsold garments and accessories. To reduce the stockpile, the company is planning to cut prices, slow expansion in stores, and boost its e-commerce instead. It may even get unsold products a second life through donation and recycling. What Is H&M Doing with Unsold & Used Clothing? Positioning itself as a leader in the sustainable fashion and design industry, H&M is ambitious to meet 100% circular and renewable by using only recycled or sustainably sourced materials, prolonging product lifespan, and minimizing environmental impacts along the value chain. 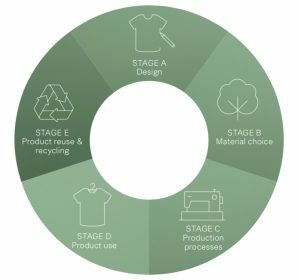 The company identified five key stages within its value chain to pioneer sustainability practices: design, material choice, production processes, product use, and product reuse and recycling. 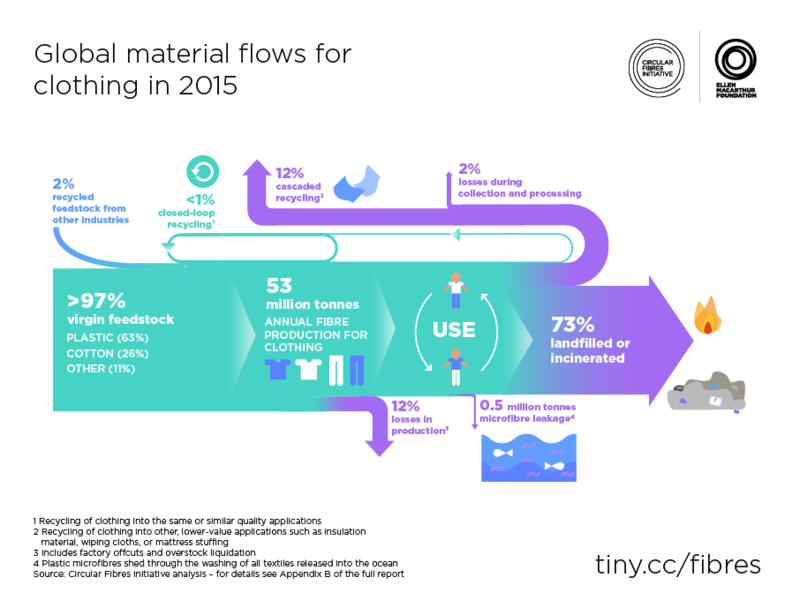 Among all, reuse and recycling of waste products and materials have posed a great challenge as fast fashion brands often rely on a high volume of sales and a break-neck rate of growth, resulting in an upsurge of textile waste. To address the waste problems, H&M is early promoting a closed-loop model, where instead of sourcing from virgin materials, fibers and cotton come from only reused ones and are recycled anew after usage, until they can be harmlessly discharged into the environment. It has created six annual Conscious Exclusive collection, which features well-crafted womenswear, shoes, and accessories made from eco-friendly fabrics and recycled polyester. Meanwhile, the company also collects garments from consumers through a take-back program, which awards customers a discount if they drop off unwanted items in any of its 4,500 shops. Working with a global recycling company called I:CO, it collected 17,771 tonnes of throwaway garments last year and passed on to recycling plants across the world. But in reality, only a small part of used clothing is recycled into fibers and ultimately made into new clothes, 5-10% to be exact. 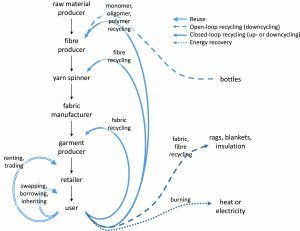 60% of textiles end up in secondhand stores for resale, 6% in incineration facilities for energy production, and the rest is and repurposed for cleaning cloths, insulation in houses and cars after being sorted into 300-400 different categories to decide the most effective next use. What poses a sharper contrast to its ambition is the way H&M handled unsold clothing. A Danish TV investigation revealed that the international retailer had sent 60 tons of new and usable clothes to an incineration facility in Denmark since 2013. In Västerås, Sweden, a local power plant is burning defective products H&M cannot sell to generate electricity. Last year, the plant burnt roughly 15 tons of its disposed inventory, although the company claimed to only incinerate products that are mold infested or disqualified from safety regulations. Fast fashion and sustainability seem contradictory in almost every aspect. Cotton growing requires a large volume of water and pesticides. Textile dyeing contributes to global water pollution more than any sectors except agriculture. Apart from the negative environmental impacts, the industry generates an incredible amount of waste. Estimates show that more than half of fast fashion products are disposed of each year, which eventually ends up being buried or burnt. A waste-free fashion business is nearly impossible to achieve with today’s technologies and business models. Reuse is one of the best ways to prolong the practical life of clothing. However, the increased disposable income levels, loss of sewing and mending skills, and cheaper textile products make it less favorable among consumers. The diminishing of impetus for reusing and repairing is also attributed to a lack of industry tools and standards for circular design, supportive regulatory environment, and a well-established network of stakeholders to help the trade and exchange, such as second-hand shops, flea market, charities, and online marketplace. One reason that may explain H&M’s low recycling rate is that natural textiles are mechanically shredded when recycled. The process shortens the fibers, so virgin materials must be incorporated into recycled fibers to strengthen the yarns. Partnering with the Hong Kong Research Institute of Textiles and Apparel (HKRITA), H&M is investing in the R&D of a chemical process that can fully separate and recycle cotton and polyester blends without any quality loss. But so far the technology proves hard to scale up in the market. Donating or reselling the used clothing has its drawbacks. Contrary to general presumption, most clothes do not find its way in local vintage stores; instead they are exported to developing countries in Africa because demand for secondhand clothing is far lower than its supply. While the influx of cheap, old garments severely undermine the industry growth in destination countries, big brands are carefully walking away from donations. The resale of defective returns may also stain the company’s reputation. Consequently, destroying reject clothes like incineration become popular worldwide, particularly among luxury labels, to prevent them from reappearing on the market. Ultimately, fast fashion’s business model remains the biggest challenge – retailers desire low-cost and speed to market. To generate more profits or sell more products, the industry encourages consumers to sustain their love for constant newness by shortening seasons and expediting new trends. Consumers see clothing as more disposable than it used to be. Unwanted items that you take to a second-hand store are likely to be rejected because of their poor quality, low resale value, or rapid obsolescence. Moreover, the number of recycled materials can hardly meet the skyrocketing production need of fast fashion. At H&M, the company claimed to collect more than 56,000 tons of garments globally through its take-back program, equivalent to about 260 million T-shirts. However, it manufactures at least 600 million items each year. The sheer quantity of virgin resources will easily dwarf any efforts to recycle the waste materials. There is a multitude of approaches for retailers to develop sustainable fast fashion. 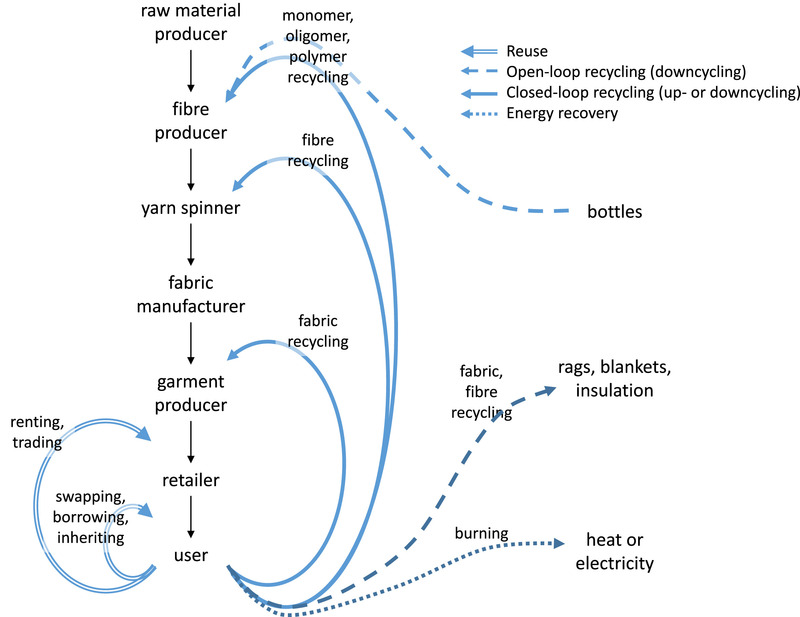 Generally speaking, textile reuse and recycling generate less environmental footprints than incineration and landfilling, and reuse is even more beneficial as it not only reduces virgin material production but also minimizes the environmental impacts associated with manufacturing and engineering processes. In the search for more productivity, efficiency and lesser environmental impacts of textile products, the design process should integrate requirements from all fields affecting the industry. This encourages companies to design not only for assembly, manufacture, and quality, but also for disassembly, recyclability, and end-of-life. Companies can lead by increasing the use of recycled content in their design of new products and investing in the development renewable fabric materials, meantime, they are also in dire need of proper training in circular design, integrating circularity in design briefs, and promoting customer care and repair. Sustainability may not be the pivot in supply chain management, but a range of drivers are pressuring companies to adopt more sustainable practices, such as compliance and customer demands, competitive advantages and prevention of reputation loss. Achieving this end requires the concerted efforts of all stakeholders involved, with manufacturers and retailers as the focal, suppliers in general, and consumers and governments in support. Companies are best positioned to drive partnerships of finding circular solutions across their entire value chain and to engage sustainable suppliers through recognition, support, and rewards. Textile waste management is a collective responsibility, from collection and sorting, to recycling and disposal. This encompasses nongovernmental organizations programs, nonprofits partnering with brands on take-back programs, as well as municipalities in charge of curbside collection programs, albeit they are few and spotty. 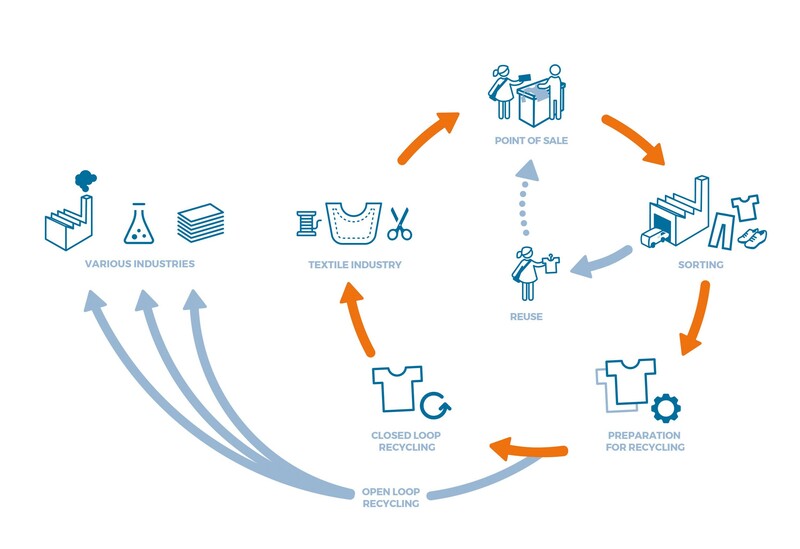 Increasing industry collaboration in collection, sorting, reusing, recycling, repurposing and designing for circularity is important for fast fashion leaders to build a network to connect and share experiences and best practices. Despite the fact that textile is becoming one of the fastest growing wastes, understanding the magnitude of the problem and the various options of curbing the waste poses a challenge to brands, retailers, and consumers. When it comes to making strides toward a circular-fashion model, recognize how different stakeholders contribute to the waste should be the first step. Retailers and their suppliers can by using eco-friendly materials, improving production efficiency, and creating durable clothes. Additionally, there are various means for them to educate consumers and the market, including encouraging their customers to reuse their garments, providing options to shop at socially conscious brands, and taking preventive measures (e.g. protect clothes from marks and stains) to help extend the service life of clothing. In short, mounting textile waste can upend the entire fast fashion industry with catastrophic consequences to the environment and society, but can also offer a window of opportunity for businesses to transition toward a more circular model. Only if they take proactive actions can they tackle the waste crisis and realize the true sustainability. Tags: fast fashion, Sustainability, waste.